Spartacus began 16 years ago when Mike and Sue Blair took 200 pounds and set out to build a sandwich company that would change the way the people of Aberystwyth would see the humble sandwich. 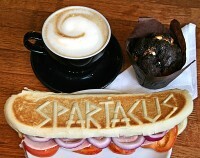 They had many ideas and lots of views on what was involved in producing a sandwich that would make people not only remember Spartacus, but would also bring them back. Well, their policy then is exactly the same as it is now. Quality, quality, quality. Mike and Sue have always been of the opinion that if you sell quality, then you will sell it not only once, but twice, three, four, five, etc, etc. You can also sell rubbish, but you will only sell it ONCE. 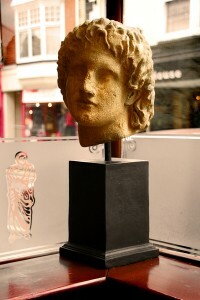 So, Spartacus began all those years ago, with that small amount of money, but also with a large amount of ambition, and a determination to not only succeed, but to make a difference, and to change the way the people of Aberystwyth would look upon the 'humble sandwich'. Sixteen years later and Spartacus has two shops in the town, a sandwich supply business, supplying the university, Spar shops, garages etc etc. We currently employ twenty plus staff and feed a large portion of the town on a daily basis. We believe that we HAVE succeeded in changing the way the people of Aberystwyth look at the 'humble sandwich'. So, if you have yet to try a Spartacus, (you must be in the minority) and you live in the Aberystwyth area, we ask you come and see us, put us to the test, or as we say in Spartacus 'come and savour the difference'.